Lay It Down: Living in the Freedom of the Gospel is a bold declaration of the overwhelming grace of God. More than merely saving us in our sin, by grace God delivers us from it, making us new creations and treating us accordingly―no matter what. For a generation of Christians who have learned a gospel of performance and striving, Lay It Down offers the good news of the grace that is already ours in Christ. 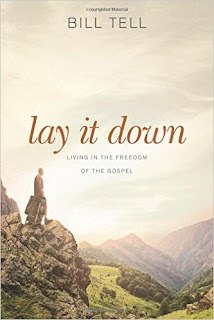 Lay It Down: Living in the Freedom of the Gospel by Bill Tell is a wonderful book! God delivers us from our sins making us new creations and treating us accordingly. That's not really easy to comprehend but it's a fantastic thing that God does for us. We continually beat our selves up for our sins even after we've been forgiven. In Lay It Down: Living in the Freedom of the Gospel by Bill Tell we learn to truly lay it down and heal which opens up new freedoms and helps us embrace the gospel in new ways. I absolutely love this book and found it to be extremely helpful! You can find Lay It Down by Bill Tell on Amazon, Barnes and Noble and other bookstores.